Fish put straight onto ice slurry are used for human consumption. Yellowtail are caught with handlines and seine nets and are often associated with schools of pilchards. 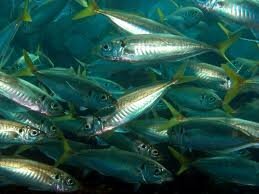 They are a pelagic fish that form large schools in marine inshore areas such as estuaries and bays. Adult fish are generally found over offshore rocky reefs, while juveniles are generally found in shallow, soft substrate areas. The yellowtail horse mackerel, Trachurus novaezelandiae, is a jack in the family Carangidae found around Australia and New Zealand at depths of up to 500 m. Its length is up to 50 cm. Yellowtail scad are usually found in large schools. They are usually called yakkas. Sabiki Bait Rigs are a great way to catch yellowtail yakkas. Use a small size hook (Size 12). You don't have to bait the hooks, just keep up a steady stream of burley to get the yakkas on the bite and 'jig' the rig. Just a gentle up & down movement of the jig should be sufficient. Gut and scale the yellowtail. Toss them in some seasoned flour and pan fry in some butter. They are also quite good as sashimi. CAAB Code: 37 337003, Standard Fish Name: Yellowtail Scad, Scientific Name: Trachurus novaezelandiae. Exporters of Yellow Tail, Importers of Yellowtail, Processors, wholesalers and seafood agents of Yellowtail, suppliers of Jack Mackerel Scad.